In May 1975, Kjartan Ragnarsson and Guðrún Ásmundsdóttir shot a slightly schlocky love scene for Iceland’s first ever feature film, Morðsaga (Murder Story). 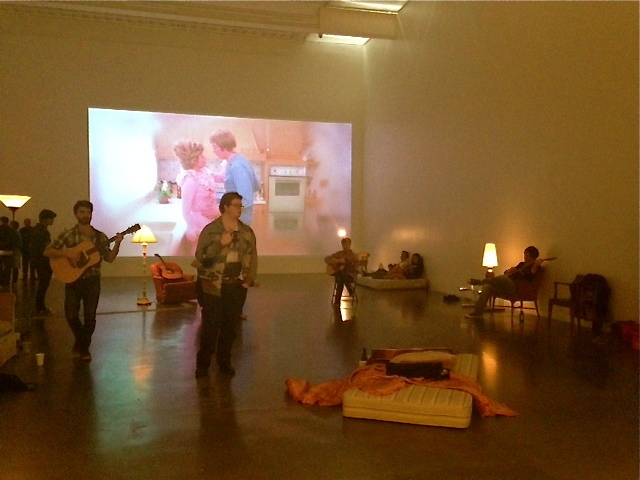 As Guðrún, playing a bored housewife, fantasises about ripping off the shirt from Kjartan’s, playing a plumber, chest, she cries out: “Take me here, by the dishwasher!” Legend has it that the day after the scene was filmed, the performance artist Ragnar Kjartansson was conceived. Walking into the fourth floor of the New Museum on New York City’s Lower East Side the other day, I heard this refrain sung in a tone mournful and dreamlike by a collection of musicians slouched across the space. “This is it. Is this it?” They sung, again and again. “I’m desperate. Take me here, by the dishwasher.” These are lines from the film, put to music by former Sigur Ros keyboardist Kjartan Sveinsson, and for two months, until the end of June, they will be sung, without pause, by 10 musicians for the length of the museum’s opening hours while the love scene plays on a loop behind them. The musicians each play guitar and sing the lyrics alone, in a troubadour style, but as each layers on top of the other, the sound became more hypnotic the longer I lingered. The few visitors to the space circled the periphery of the makeshift performance space but one man, eyes half closed and seemingly entranced, moved to the centre, inches from the foot of a mattress that was presently unoccupied but strewn with a old duvet. 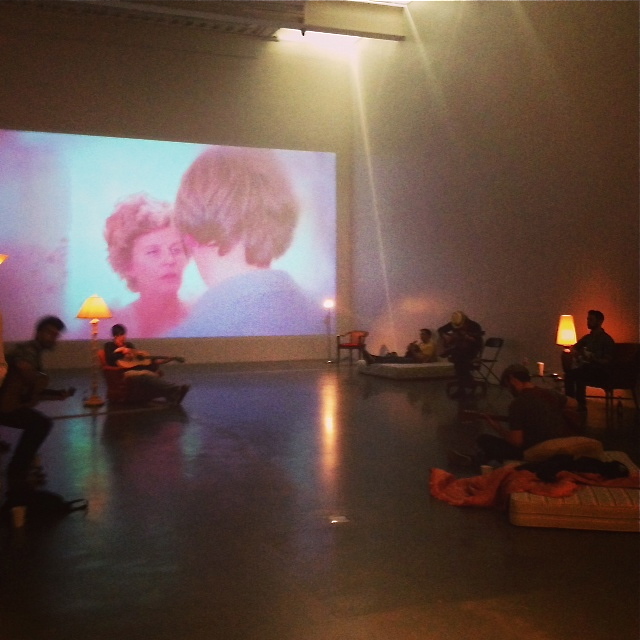 The fogged up old movie plays on the screen, over and over, while the musicians sit in armchairs under old-fashioned lamps, slouch in couches, or sit on mattresses. Some get up and walk around a bit; probably just for something to do. Beer bottles, that come out of the fridge set up by the far wall, lie on the floor, beside thrown-off sneakers. At some points the voices flag but they never fall away.